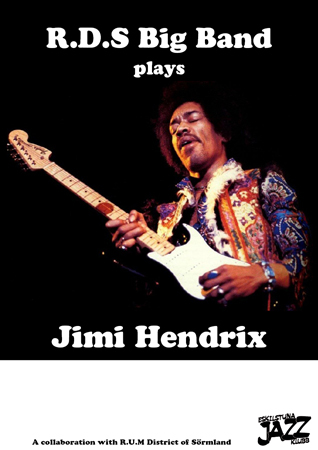 The youth orchestra R.D.S Big Band – rehearsed and lead by David Ehrlin and I – will be performing Jimi Hendrix songs arranged for Big Band and vocalists at Eskilstuna Jazz Club, this coming Wednesday 27/4. Welcome to be impressed and swept away by this band’s young musicians and their ability to create grit, groove and great solos to Jimi’s repertoire in a different setting! The concert starts at 19:30. Free admittance. Now in the time of spring, and Easter holidays, I decided to start composing a new piece on a theme I often come back to: Japanese ghost stories. I am since long fascinated by Japanese ghosts and supernatural creatures and because they most likely will appear – and I assume also will be most powerful – when the full moon is just slightly cloud covered, the new composition’s name is “The Shrouded Moon”. If I’m not mistaken: In Japanese that phenomenon is called “Oborozuki-yo”. The piece will be written for the traditional Big Band setting 5-4-4-4, and a male vocalist. The reed setting will be two flutes, alto, tenor and baritone, and as it seems from the progression so far the trumpets will play Flügelhorns throughout the piece. The lyrics is written by me, and I hope I can bring the alluring, strangely scaring apperance of a shrouded full moon to a comprehensive allegory of love in vain of an overworldly detached and conceited person. I expect this new chart to be finished, edited and published here sometime in April. Big Band concert Wednesday 17/2! 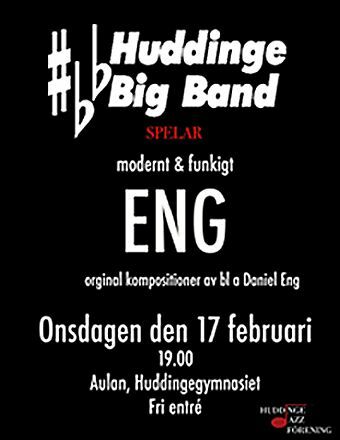 Huddinge Big Band is holding a concert under my conducting this coming Wednesday. The program is focused on modern Big Band music, oriented towards latin, funk, rock and fusion. They will perform compositions from Bob Mintzer, Matt Harris, Pat Metheney and three of my pieces – “Every Now And Then”, “Going Home From Ghana” and “Quirky Quantum Quarks”. The location is Huddinge Gymnasiums Aula at 19:00 hrs, and it’s free admission! Concert length is slightly more than one hour. New arrangement in the shop! 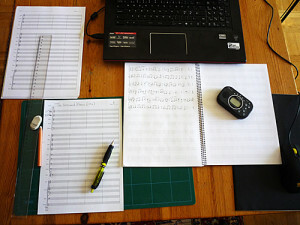 After the holidays and some digital sheet music administration, there is a new arrangement edited and uploaded in the web shop. It is the wonderful Curtis Mayfield-tune “People Get Ready” that I decided I wanted to arrange for vocalist and Big Band. It is also my first arrangement for a male vocalist. My arrangement is maybe a little more restless and impatient than the original, but I think that the vision of Mayfield’s lyrics is so poorly heeded today, that I assume I put my own frustration with the state of things today into the musical shape I gave the song. I put a lot of consideration into the musical solutions and choices in the arrangement, and I really hope that my version of this lovely tune does it right. After more than a year of work, my web site is coming to completion – mostly regarding filling it with content such as listening examples and pictures – and now it’s time to post notifications about things coming up. I currently work on an arrangement of Curtis Mayfields’ “People Get Ready” for male vocalist, and when it’s edited (in Finale) and error-checked it will be published here. This is a beautiful and sensitive song that already exists in many great arrangements, but I just couldn’t resist taking it on and I can only humbly hope that I can contribute something to it with this not too difficult arrangement.